If your shining glorious moments are playing and winning bingo then you have arrived at the right spot! Glossy Bingo is more than your average online Bingo site filled with fascinating games filled with hours of entertainment and thrills. Glossy Bingo was established in January 2013, which to be quite honest was a bit surprising. Considering the landing page design layout, it lacks the overall eye candy appeal and that’s a shame because once inside the gaming lobby the world opens up to a thrilling, unforgettable gaming experience. I guess it only goes to show never judge a book or in this case a homepage by its cover! Now for the positive feedback and folks there is plenty. The site is powered by online gaming industry leader Microgaming software. The name alone is enough said delivering premium products that stand leaps and bounds above their competitors. 128-bit SSL (Secure Socket Layer) Digital Encryption secures the server along with state-of-the-art firewall technology. Glossy Bingo is licensed to operate by the Lotteries and Gaming Authority of Malta. Captivated is the word that best describes the gaming platform. If game variety is the spice of life for you than your tastes buds will be dancing. Bingo players have their choice between to very popular games; 90 ball and 75 ball bingo. Join roomies in interactive Chat games with BBz up for grabs. Progressive Jackpot games reach impressive cash prize pools that will put a thrill in your game play. Slots and Casino games top the list for thrilling excitement offering hot titles that are among the most popular in the iGaming industry. Video Slots offer outstanding graphics, exciting features and big Jackpots. Table Games include everyone’s favorite skilled games with Blackjack and Roulette. Video Poker has a variety of gaming to choose from for those looking to hit that Royal Flush grand prize. For even more exciting action play one of the interactive multi-player games like Wheel of Wealth, Avalon and No Worries. Mums the word, but rumor has it some big time celebrities have registered an account to play here! You won’t feel left out in the cold with a warm and welcoming offer that embraces new players rolling out the red carpet from the get go. Not only will your first deposit be gifted with a Bonus but so will your second, third and fourth. There are all kinds of exciting specials going on throughout the month. Whether you are a morning, late night or weekend player there is always something extra special in the promotions department to look forward to. Reverse Bingo, Jackpot games, BBz, Guaranteed Jackpots and so much more. The VIP program treats players’ big time with fantastic rewards. Benefits include Free Spins on Slots, Cash-back and exclusive offers. With tremendous gaming, creative promotional offers and great VIP benefits players won’t be disappointed. Withdrawal are processed every Monday, Wednesday & Friday with the exception of bank holidays. Processing of cash-outs take approximately 7 days. However, please note withdrawals of £500 or greater may be subject to a longer processing period. We rate Glossy Bingo with 4 Pink Hearts. 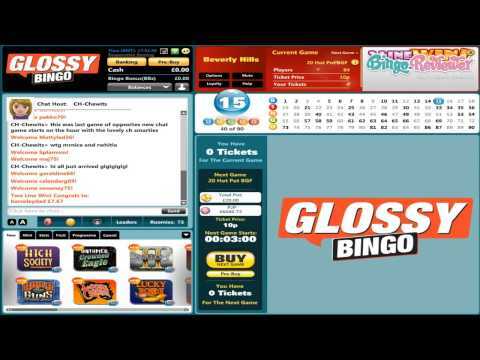 Glossy Bingo is definitely worth trying out if you haven’t already played here before. They offer a lot of fun promotions to take advantage of. All you have to do is head to the ‘Promos’ page and they have their exclusive deals divided by day, week and month. There’s something to look forward to all the time! One of my favorites is the lunchtime fever promo. Every single day, they give you the chance to win £100 at 2pm for just 10p a ticket. Not a bad deal, right? There are plenty more where that came from. On the downside, though, I was not that happy with the selection of bingo they had to offer. I like a little variety and, though I enjoy 75 and 90 ball from time to time, I would have liked to see more options available. However, if these are your favorite variations, then you’ll be just fine!